On the way home from a friend’s house one night, Bailey Walsh’s life was turned upside down. A drunk driver forced her family off the road on a cold winter night, killing everybody in the car except for Bailey. Bailey’s life was spared, but she wasn’t left untouched. Not only did she suffer broken bones and bruised ribs and now she suffers daily from a broken heart, she’s lost her smile and her love for life is gone. Bailey moves in with her Mom’s identical twin sister and lives day to day suffering from survivor’s guilt. She walks around constantly with rings around her eyes because even after 2 years she suffers nightly from nightmares. Bailey has two protective best friends and a sweet two-year old that she tends to help her get through life and gives her a reason to go on every day. However, Bailey may be able to learn to open her heart again when she accidentally runs into Collin McKenna, a senior, and his calm sweet nature wins her over and puts the smile back on her face. Collin, Bailey’s friends, and Riley work together in their own special ways, and with all their love combined Bailey begins to heal and smile again. My heart broke for Bailey, she lost everyone she loved in one night and she had to learn how to survive. When Collin entered the picture I felt myself cheering and smiling for Bailey as she got ready for dates, the first time Collin held her hand, the first time he kissed her and I loved how so protective Collin is. Not only does Collin take care of her but he also is very protective of his little sister after their mom walked out on them. 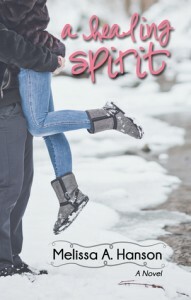 Bailey and Collin have both been dealt a tough hand in life, and together they mend each other. What an amazing story of how love helps you heal, move forward and survive tragedies. 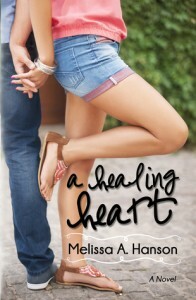 Melissa A. Hanson did a great job in creating characters, catching the raw emotions and sharing it through writing to her readers. I really enjoyed this book and already have A Healing Spirit on my list to read.